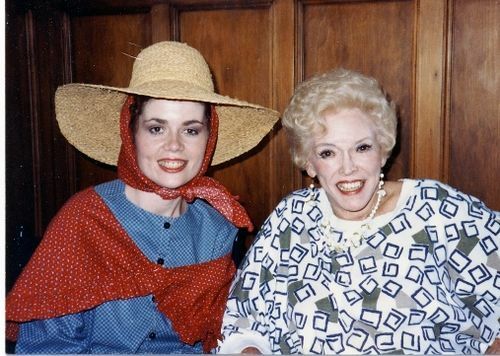 In about 1988 at the Childrens' Film Festival in LA, Cheryl Rhoads at left in her Mother Goose costume, posed with childrens' television pioneer Fran Allison (1907-1989). Fran was a television and radio comedian, personality and singer. She was best known for her collaboration with puppeteer Burr Tillstrom in Chicago and for her starring role on Tillstrom's daily NBC-TV puppet show "Kukla, Fran and Ollie", which ran from 1947 to 1957. Fran occasionally returned to the air until the mid 1980s. The trio also hosted The CBS Children's Film Festival, introducing international children's films, from 1967 to 1977. Late in her career, Fran also hosted "Prime Time", a show for senior citizens, on KHJ-TV in Los Angeles.